Squats are a great lower body exercise, and they are considered by many to be the best leg exercise you can do regardless of your goals. It is such a functional movement. We do it all the time-- up and down into chairs or picking things up off the floor. Our bodies are made to master the motion, but injuries and a sedentary lifestyle can make it more difficult for us to keep good form. Starting Position: Begin with your feet a little wider than hip width, and make sure that your feet are pointing forwards. You can have your hands out in front of you, on your hips, or behind your head. In the beginning it's okay to check your form in a mirror to make sure that you keep good alignment. Another challenge during this exercise is keeping the heels on the floor. Do you best to keep the pressure towards your heels and ball of the foot. If you shift your weight too far forwards and towards the toes it will put a little more pressure on your knees and the heels will tend to lift. Calf flexibility and ankle stiffness is a common problem that leads to the feet turning out or the heels lifting. 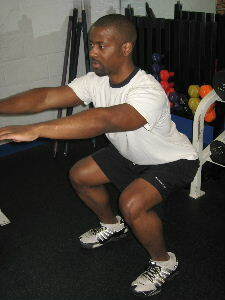 So stretching the calf muscles can help to improve squatting form and take pressure off the knees. 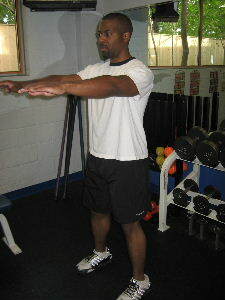 Once you master this exercise with good form, then you can add resistance. You can use dumbbells or a barbell to increase the resistance and really strengthen your legs.